We have been busy over the summer updating our website and application systems and we’re excited to announce that we are now accepting applications for 2018. The new system streamlines the booking process, showing referrers the best available breaks matched against the family details provided. It also creates a single view of all applications made, alongside their current status and family feedback, together in the same place for the first time. All existing referrers will need to register with the new system before you can login and make applications. New login details will be circulated within one working day. 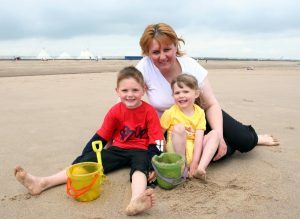 The Family Holiday Association helps families with a child or children under the age of 18 and those who care for them – be they parents, grandparents, carers or older siblings. Most of our short breaks are at seaside holiday parks, staying in a self-catering caravan. We also work with a wide range of other holiday parks, hotels and hostels who donate availability to us. We provide families with their holiday accommodation and can sometimes make a contribution towards expenses for travel / food etc. The majority of breaks take place between Easter and the end of October. 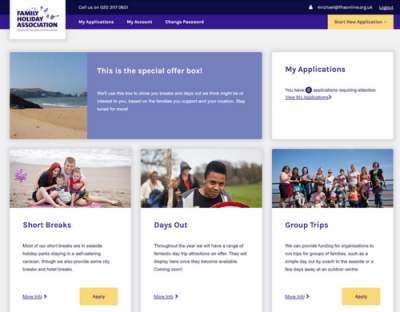 We can also provide funding for organisations to run trips for families, such as a day out at the seaside or a few days at an outdoor centre. The first deadline for group applications is 31st January 2018. We are especially keen to receive applications from organisations who take an unusual or innovative approach to supporting families through trips and breaks. Applications for day trips will open later in the year.